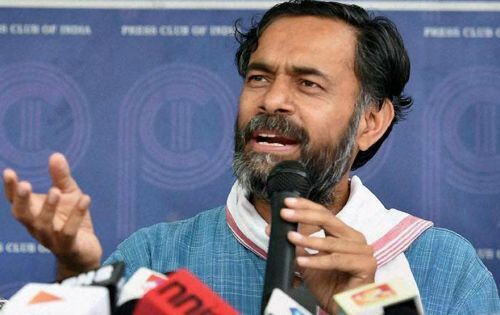 Swaraj Abhiyan leader Yogendra Yadav was detained today in Tamil Nadu while on his way to meet farmers protesting against a proposed eight-lane expressway. Yadav tweeted on Saturday afternoon about the police stopping him from going to meet farmers. He also posted a video on Twitter. 'TN police has detained me and team in Chengam PS, Thiru Annamalai district. We came on the invitation of Movement Against 8Lane Way. We were prevented from going to meet farmers, phones snatched, manhandled and pushed into police van. First hand experience of police state in TN! 'I had spoken to Mr Kandasamy, Collector, Thiru Annamalai about acquisition and complains of police excesses for 8 lane way. He completely denied any police interference. Within minutes of the phone call police detained us. 'Supdt. Police, Thiru Annamalai is here to tell me hay they apprehend law and order problem due to my presence! I am saying I will only visit farmers inside their homes. SP says I am not allowed! Gandhian disobedience is the only way out, it seems (sic),' Yadav said in a series of tweets.